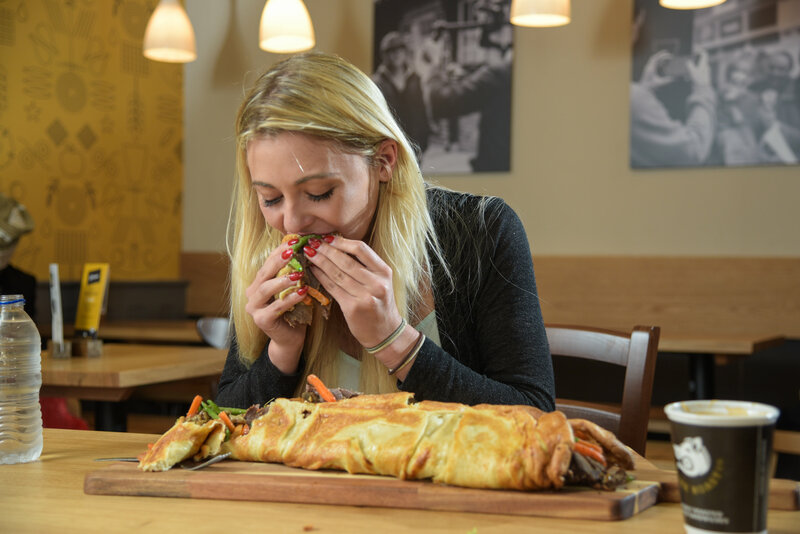 Kate Ovens, 24, takes on the 2.5kg yorkshire pudding wrap (unwrapped in photo) at York Roast Co., which is roughly 5% of her bodyweight, and finishes in 55 minutes. A petite food blogger devoured a massive Easter roast dinner big enough to feed a family-of-four – all wrapped up in a 20inch YORKSHIRE PUDDING. 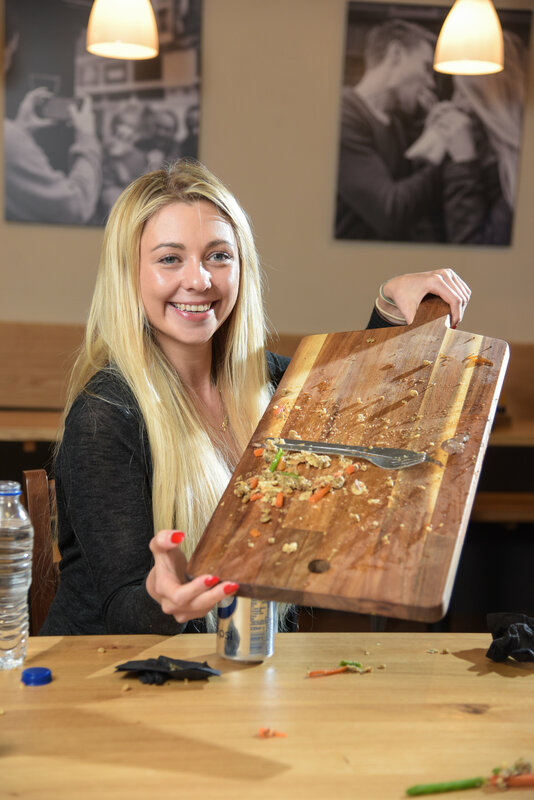 Super eater Kate Ovens managed to polish-off the giant Yorkshire pudding wrap – containing enough roast beef and vegetables to feed a family-of-four on Easter Sunday. The giant snack measured a whopping 20 inches long – and weighed a massive FIVE pounds. 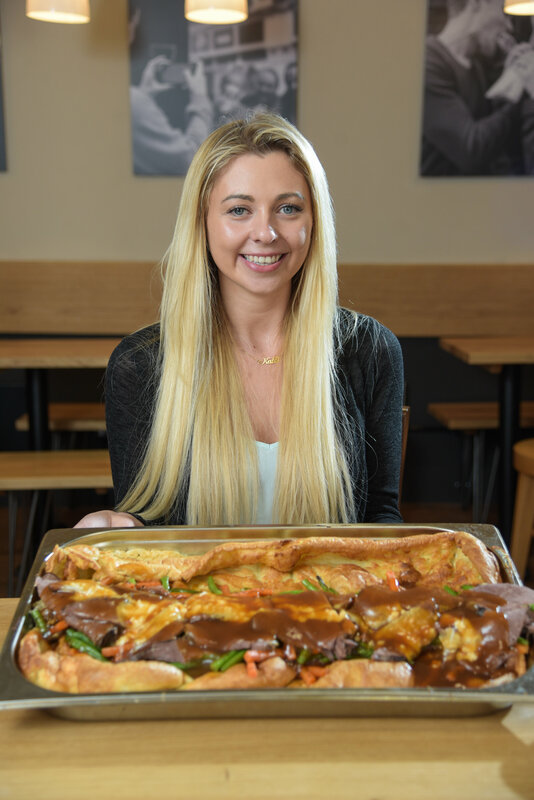 Kate, 24, from London, travelled to the home of the Yorkshire pudding, York, to take on the seasonal treat – which was filled with half a pint of gravy. The presenter, originally from Fleet, Hamps., said: “When I first saw it, I was terrified. “I thought to myself that there was no way that I’d be able to finish it. “But I just tucked in and got on with it, and to my delight and surprise, I managed to pull it off. Kate took just under an hour to munch her way through the huge snack, which was bigger than her arm. She ate the specially created Beastly YorkyPud Wrap from The York Roast Co on Wednesday. The 5ft 5ins stunner tucked into the massive wrap, which also contained heaps of the finest British beef, six stuffing balls, piles of veg – all rammed inside a Yorkshire pudding bigger than a hubcap. 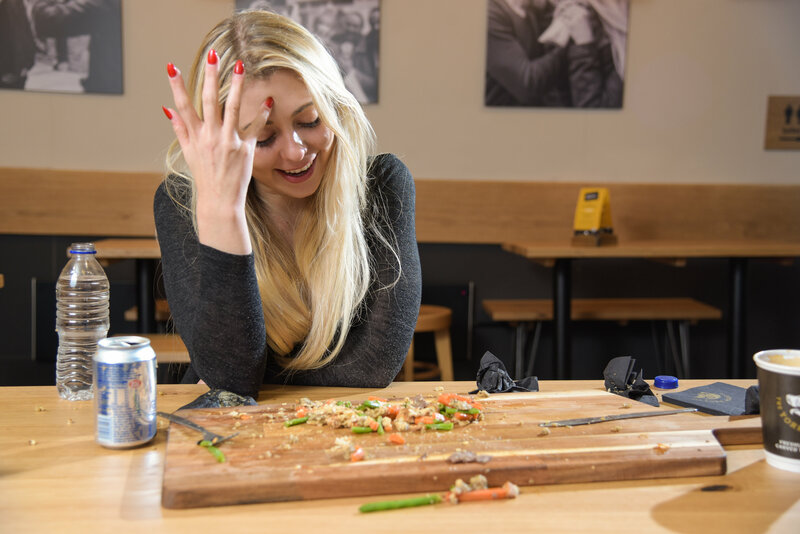 She said: “It was the vegetables that saved me, really. “Most of my challenges don’t really include a lot of vegetables, but this one did and it really helped me get through. The 20-inch wrap, which had a ten-inch girth, was so giant it had to be cooked on two panini presses – because it was too long for one. The York Roast Co have been selling YorkyPud wraps for about a year, but the beast Kate demolished was ten times larger than normal. Mastermind behind the mammoth dish, Wayne Chadwick, was astonished that anybody would dare take on the huge snack, let alone finish it. 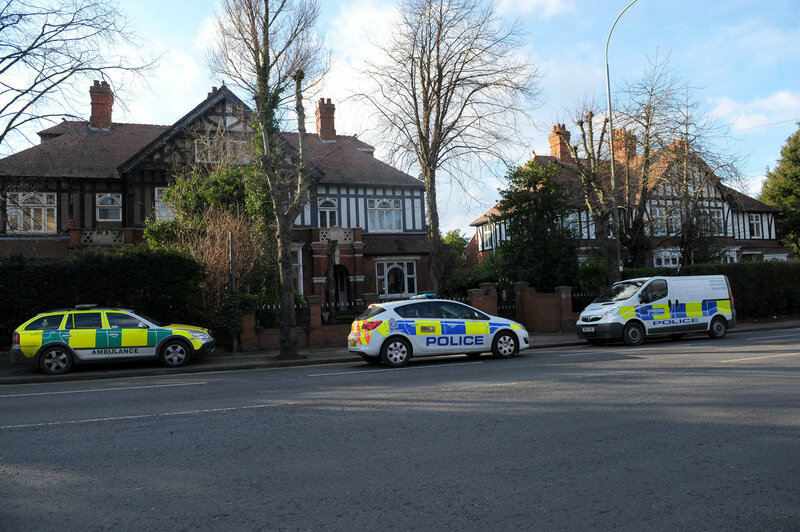 He said: “I was absolutely amazed that this little, petite lady managed to polish off the entire thing. “I think it was the fresh, roasted vegetables that helped her along. He has no plans to sell the massive wrap that Kate defeated, but they will be selling a ‘Beastly YorkyPud’, one-and-a-half times larger than their normal ones. Kate has more than 100,000 subscribers on her ‘Kate Ovens’ Facebook page and her eating challenges videos regularly rack-up hundreds of thousands of views. She added: “I would say that this was among the toughest challenges I’ve completed to date. 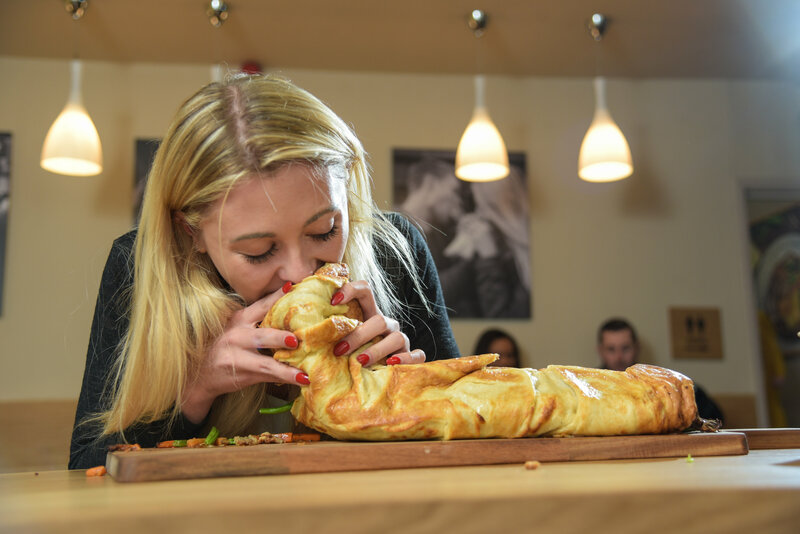 “The three-foot-long sausage roll was a big eat too, but this challenge had significantly more girth.